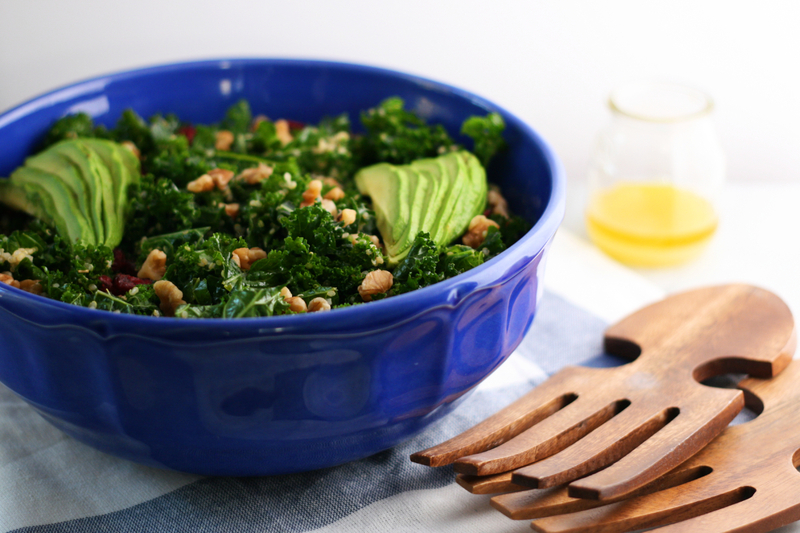 How do you make your kale salad? So you are short on time and you want a super salad, something healthy and loaded with vitamins and essential minerals. What makes this salad super and what does it do for you? Kale: Let me just say what I have been thinking - Everyone should eat more kale. I will be honest, I was late to the kale party. First off, kale is low in calorie, high fiber. It is loaded with vitamin A, K and C to name a few. It has powerful cancer fighting compounds and antioxidants. In short, kale is a mighty leaf. Eat more kale! Quinoa: high fiber, high protein and low carb whole grain. Walnuts: high in omega-3 fatty acid, folic acid, vitamin B6 - especially important for folks on vegan diet. Avocado: high in fiber, potassium, vitamin B9, B6. Are you ready to try out this super salad? I hope you enjoy this crunchy, tangy flavorful salad. Also we love our wooden salad servers :) ! In a bowl, whisk together olive oil, herbs, salt, pepper, and lemon juice to make the dressing. Toss in about 1/3rd of the leaves in the bowl. Using tongs or your hands, massage the kale leaves with the dressing. Kale greens should appear a little darker coated in the dressing. Lemon is going to help break down some of the chewy texture of kale. Fold in the quinoa, walnuts, and dried cranberries. Top with sliced avocado. Consume within an hour. Try sunflower seeds, instead of the walnuts.